AT THE HEART of the commission Christ gave His Work is the command to PUBLISH THE GOSPEL! (Mark 13:10.) The radio and television broadcasts alone are not sufficient to fulfill this commission in this modern age. The Good News of God's coming kingdom and other vital information on Christian living and prophecy need to be printed and published as well as preached! Performing this necessary task is not as simple as it may sound! Today this Work is reaching millions with printed material containing vital spiritual truths unavailable from any other source! But our printing operations have not always been so large and of such high quality. The Ambassador College Press had a very humble beginning. Volume 1, Number 1, of The PLAIN TRUTH made its humble appearance a month after The WORLD TOMORROW radio broadcast first went on the air. Less than 200 copies were distributed — all had to be addressed by hand, by Mr. and Mrs. Herbert W. Armstrong. The "printing facilities" were not only inadequate, they were nonexistent! Mr. Armstrong had cherished since 1927 the idea of a magazine to be called The PLAINT RUTH. Back at that time he had made up an entire "dummy" of this proposed magazine, and had even written articles for it. He even had a professional letter artist design a front cover idea in 1927 -and had tried designing one himself. But there was never the "wherewithal" to start publishing a magazine. That ambition to publish The PLAINT RUTH was the natural outgrowth of earlier business experience. Much of Mr. Armstrong's 20 years of advertising experience had been spent in the class magazine field. Then, in January 1934, he realized that this magazine was a must as a backup for the radio broadcast. Yet he and his wife were no more able, financially, to produce it than they had been in 1927. Necessity is the mother of invention. Since funds were not available to publish a high-quality, professional-appearing magazine, he decided to simply convert the mimeographed "Bulletin" he had been issuing for the scattered Co-Workers in Oregon's Willamette Valley into The PLAIN TRUTH. The first issue of The PLAIN TRUTH came out February 1, 1934. At that time Mr. Armstrong was editor, researcher, typist, compositor (he cut stencils on a typewriter), publisher, business manager, circulation manager — as well as errand runner, window washer and janitor. Mrs. Armstrong was assistant researcher, adviser, printer (she ground out copies by hand on an old secondhand Neostyle, ancestor of the mimeograph), and mailing room staff (she kept a handwritten mailing list, addressed all copies by hand). They were the entire staff. That was the birth of The PLAIN TRUTH! Mr. Armstrong had to borrow the typewriter from a neighbor who lived in the country. There was not money for the usual quality of mimeograph paper. He had no mimeograph, so he arranged with the mimeograph sales office in Eugene to come into their office and borrow the use of theirs. The sole cost of publishing that first issue of The PLAIN TRUTH was the cost of the few stencils, and the 600 sheets of paper used to print about 150 copies, plus the postage he would have to buy later after radio listeners wrote in requesting the magazine. Even at that, it seemed a giant sum. He had no stylus with which to letter in the headlines. He used a pencil instead, working in the headlines for the articles by shaky freehand work, holding the stencil up against the windowpane at the farmhouse where he stayed in Eugene, Oregon. It was a crude, home-produced mimeographed "magazine" — but to Mr. Armstrong, it was the realization of a dream of seven years! Mr. Armstrong's editorial in that first issue stated what has been the guiding principle of all our publications: ''In these anxious days of stress, turmoil and strife; of revolution and economic collapse; of war and fear of war; of confusion before a bewildering onslaught of creeds, dogmas, fables and false teachings, The PLAIN TRUTH makes its humble and modest appearance. "The PLAIN TRUTH comes with a definite mission. It comes in a sincere effort to help lead those who honestly are hungering and thirsting after righteousness out of this modern confusion of tongues, and into the truth as it is in Christ Jesus. "The real truth is simple and plain...."
It was about November 1, 1933, that a few special offerings made it possible to purchase a very old, used, out-dated Neostyle — the predecessor to the mimeograph. It was entirely hand-operated. The sheets of paper had to be fed into it one at a time by hand. There was nothing automatic about it! It cost $10. The Co-Workers were also able to supply the $10.00 for the purchase of a secondhand typewriter! That was the beginning of the Ambassador College Press! Of course, there was as yet no Ambassador College. And a Neostyle is not a press. But it was a beginning! But when the old, antiquated Neostyle finally was wearing out — about to lie down and cease functioning because of old age — a new mimeograph became an absolute need — or else The PLAIN TRUTH had to cease publication, and die a natural death along with the Neostyle. So it was, that on February 4, 1939 - five years after the first issue of The PLAIN TRUTH, a letter to our few Co-Workers said, "I will have to tell you that we are very seriously in need of a new mimeograph machine. The present one is about worn out, and we are producing this issue of The PLAIN TRUTH under difficulties. I can get a very good used mimeograph, almost new, one capable of turning out the large amount of work that is necessary in this office, and that will last for several years, for $65. There is not one cent available for the mimeograph, unless some of our friends can send in a special and additional offering just for this purpose." By April 5, 1939, another letter to Co-Workers reads: "At last, after many unavoidable delays, we are sending you The PLAIN TRUTH. This issue goes to about one thousand new readers. It is still mimeographed, because we have not enough funds to print it, as we did two issues last year. It is a tremendous task, and nearly all the work is done by Mrs. Armstrong, our daughter Beverly, who is office secretary, and myself." So in spite of the lack of a proper office, deficiency of light or ventilation, shortage a€ desks, filing cabinets and office equipment, the Work was growing! The PLAIN TRUTH circulation was growing. It was not produced every month. There were seven issues in 1938. The June number was only the third during 1939. It was issued as often as there was enough money for paper, ink and postage. Yet already this little mimeographed magazine was being read by thousands of people — expounding the very Gospel Christ Himself preached. Commencing with the August-September 1940 issue, The PLAIN TRUTH began to be commercially printed. Except for two crudely printed issues in 1938, The PLAIN TRUTH had been mimeographed ever since it started. But now The PLAIN TRUTH was growing up — at least enough to begin as a printed magazine. The August-September issue, and the few to follow, were still printed on a very low-cost yellow paper that had been used for years for the mimeographed editions. It was only eight pages — and was issued only bimonthly. In 1946, the "Press" took another leap forward: The first real printing department the Work had was established. Now The PLAIN TRUTH itself would continue to be printed commercially until 1964, but the Work had grown, and there was the need of much other printed literature besides The PLAIN TRUTH. Mr. Armstrong's son-in-law James Gott had been working in the lumber industry in and around Eugene. He had suffered a severe accident to his left hand, which required an operation involving considerable plastic surgery. While Mr. Gott was recuperating, Mr. Armstrong learned about the Davidson duplicator press. This small but modern press printed by the offset method. Mr. Armstrong learned from the Davidson Portland office that they had facilities for training inexperienced men in the operation of this equipment. Mr. Armstrong suggested the idea of starting a printing department to his son-in-law. They would print booklets, letterheads and envelopes — though not, of course, The PLAIN TRUTH. Mr. Gott became immediately enthusiastic with anticipation. It was quite a hurdle to purchase that little press, with sufficient photographic and plate making equipment to produce the plates. But the financing was arranged. He took the schooling, and a Davidson representative helped get the equipment installed in the basement of the IOOF Building in Eugene, where offices on the third floor were rented. Later, the printing office was moved to another building with larger space, as the department began to grow. When the Headquarters was moved to Pasadena for the opening of Ambassador College in 1947, the printing department had two of the Davidson presses, and an old-fashioned secondhand paper cutter, By this time there was an assistant, and the department employed two men full-time. Gradually the department grew. Virtually all of our booklets have been produced by this department through the years. One of the reasons for moving from Eugene, Oregon, to Pasadena was the fact that the printing facilities available in commercial print shops in Eugene for printing The PLAIN TRUTH had been outgrown. Arrangements were made for having our magazine printed by the largest printing establishment on the West Coast — Pacific Press, Inc. in Los Angeles. Today Pacific Press prints the West Coast editions of Life, Time, Newsweek, and many other large-order accounts. It wasn't until the combined issue of the January-February 1949 PLAIN TRUTH that the magazine went to 16 pages. April, 1956, saw the next step forward to 24 pages, and the addition of a cover picture with a border — but still all in one color. The second color was added soon, with the February 1957 issue. In 1957 the Work acquired an almost new two-story furniture warehouse as an addition to our rapidly expanding college campus. This was remodeled and modernized into our home for the Ambassador College Press. The printing department moved into the rear portion of the ground floor. At that time two larger Miehle presses were added, and a new paper cutter — besides new folding machines and other equipment. Soon that space was outgrown. The offset department was then moved into a smaller building across the street. Then the printing department was forced, later, to lease an entire store building some two blocks off the campus, and two still-larger presses were installed, in addition to an Intertype typesetting machine, and other equipment. That didn't hold the department long, either. As the demand for booklets multiplied, the printing department grew and grew. It became the largest printing plant (outside of newspaper plants) in Pasadena. But soon that large space was overcrowded — and there was not sufficient room for paper storage. It now became evident that we needed to take advantage of the savings made possible by buying paper in carload lots. Finally we had opportunity to purchase the plant and buildings of the Crown City Lumber Company, across the street from the original Press building. This meant a sizeable expansion of the college campus. By this time The PLAIN TRUTH had expanded to 32 pages. And the demand for booklets had grown and grown. Back in 1952 — the first year for which records are available — 20,000 booklets were printed. Of course a myriad of other jobs had been done by the shop as well. And 1953 showed 55,000 copies of nine booklets printed (there weren't many booklets even written at that time). Production in 1954 jumped to 150,650. By 1957 the number had grown to 248,000. A whopping 1,222,000 booklets — way out of proportion in growth — were published in 1960! We didn't pass the million-booklet mark again until 1963, when we printed 1,048,400. The total number of pieces (complete magazines, reprints, etc.) printed in 1964 was 8,453,063. That number continued to grow and grow, and last year — 1970 — the total number of pieces of literature printed was over 33,000,000. June 1961, brought another eight page section, making The PLAIN TRUTH a total of 40 pages — and the circulation was up from the original 150 to three hundred thousand! Another jump in pages was made in February, 1962. A heavy, glossy paper cover was added in January, 1963, and with it the addition of four extra pages. At last it was beginning to take the shape originally designed for it by Mr. Armstrong back in 1927. The year 1964 brought a historic step forward. The Ambassador College Press began printing The PLAIN TRUTH assuming at the start a circulation load of 510,000 copies. 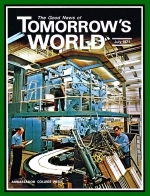 In February, 1965, the first PLAIN TRUTH with a color cover was printed, and exactly one year later the first PLAIN TRUTH in full color was published. In 1968 we completed our new Press Building, one of the largest on the West Coast in terms of floor space. We began transferring our operations to it in the fall of 1968. Since that time, the Press has continued to steadily grow and expand. The acquisition of two huge 4-color web-fed presses — first a Halley-Aller, and now the Goss P-50, besides the many other sheet-fed presses — equips God's Work much more effectively for the publication of the Gospel! Many had claimed it was impossible — that we didn't have the manpower, training, experience or equipment to do such a job. And in reality, that was a pretty good sizing up of our circumstances. But God enabled it to be done! It was printing by faith. This entire Work of God has been and is being done by faith! A comparatively small group of Co-Workers has supported God's end-time Work for many years now. Humanly speaking it would have been impossible to accomplish what has been done. But with God it has been accomplished. And the best is yet to come! In the next issue be sure to read the rest of the story of the Ambassador College Press and the facts concerning more recent developments as well as what is projected for the future!